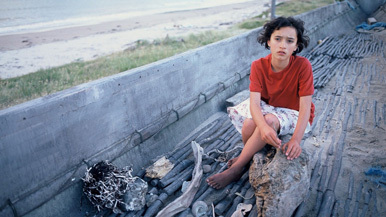 2002’s Whale Rider was a movie that hit me like a ton of bricks when I first watched it. It’s the touching story of Paikea (Keisha Castle-Hughes), a 12 year old girl living on the coast of New Zealand with her grandparents. Her community is led by her strict grandfather Koro (Rawiri Paratene), who is searching for the next generation of leader, as Pai’s grieving father left the country after the death of his wife and Pai’s twin brother in childbirth. Paikea is obviously the best candidate to lead them going forward, but as Koro keeps telling her, girls can’t be the leader. It has to be a boy. We’re first dropped into the story as Pai narrates her birth, including the death of her brother, who was destined to be the leader they needed. Her father, Porourangi (the great Cliff Curtis, playing his native Maori heritage for once instead of the Latinos or Middle Easterners that he frequently plays in Hollywood) named her Paikea, after the legend of the great leader that traveled from Hawaii to New Zealand on the back of a whale. Koro tells his son not to name her that, that’s a boy’s name and a leader’s name, but Porourangi insists. We then jump to 12 year old Pai and her lifelong struggle to connect to her grandpa who loves her but resents that she isn’t the boy he wanted to lead his community after he’s gone. Pai is comforted by her grandma Nanny (Vicky Haughton), but Pai is a sensitive kid who takes in all of her grandpa’s criticism and feels inadequate that she’s a girl. Koro decides to round up the boys in the community, teach them how to be men, and see which one is the best leader. Koro teaches them history, stick fighting, haka, and other traditions. The results are a mixed bag, at best. We know from movie conventions that Pai will rise to lead the community and her grandpa will begrudgingly accept her even though she’s a girl. The pleasure of this movie isn’t in the surprises of the plot, but in the many details added to flesh it out. When Pai is turned away from the leadership classes and wants to learn stick fighting, she turns to her uncle, Rawiri (Grant Roa), who was a champion stick fighter in his youth but has degenerated into overeating and smoking pot with his girlfriend Shilo (Rachel House, who I was delighted to see turn up recently in fellow New Zealander Taika Waititi’s movie Thor: Ragnarok, as Jeff Goldblum’s irritable bodyguard). So Rawiri starts teaching Pai, and she learns faster than any of the boys. Meanwhile Rawiri starts exercising again, stepping up and finding himself after being spiritually awakened by helping teach Pai. You can see that Pai is unintentionally leading, just by being herself, inspiring those close to her to be better versions of themselves. The girl is a natural leader, but the one person who needs to see it is the one that doesn’t. Koro is too stuck in the old ways, the traditions. Those ways are dying because Koro is refusing to adapt. All of this is handled so beautifully by writer/director Niki Caro. She handles her young actors very well, allowing some of the awkwardness of youth to shine through but not pushing it. The native traditions are all shown respectfully, affectionately. From the stories to the greetings to the respect shown to elders and the accompanying rebelliousness of the youth, so many aspects I recognize from our Native American culture here in the US are mirrored in this native culture of the Maori in New Zealand.